Did you know bristlecone pines were ancient? 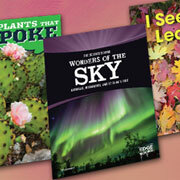 Check out these fascinating plant and animal adaptations. 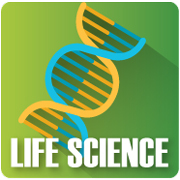 Ranging from natural disasters and phenomena to defensive plants and micromonsters, these varied and eclectic series will hook readers while imparting a deeper understanding of life science. More water, please! This season’s offerings are all about maintaining and preserving our blue planet, with just a glimpse of the devastating capabilities of nature. 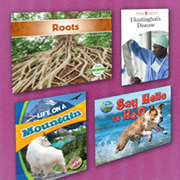 Learn about biomes, water treatment plants, tsunamis, genetic diseases, and much more. 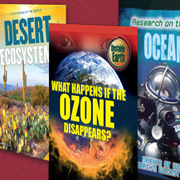 With so much focus on unusual feats and destructive natural and human-caused events, perhaps it’s not surprising that almost half the series in this season’s science line-up use disasters and extreme conditions to attract readers. 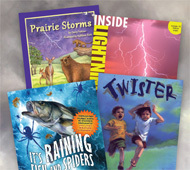 These titles look at the science behind the development of storms and other weather phenomena, the economic and human impacts, and the abilities to predict and mitigate future occurences.